Here's a killer feature for you: Mini Tree! The Mini Tree displays only the paths you have actually used. This makes browsing blindingly fast (it's instantaneous even with deeply nested subfolders), it makes the tree ridiculously small, and it makes you feel like being back in control (because you look at just the folders you are actually using, instead of being avalanched by all the folders that have accumulated on your drives over the years). 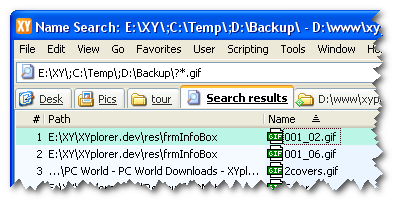 ... and E:\XY\, C:\Temp\, and D:\Backup\ are searched for GIF files. Quick Searches are remembered in tabs and across sessions, you can save them as Favorites or assign Keyboard Shortcuts to them. Dramatically increased startup speed! Depending on a number of factors you can expect a 2 up to 5 times faster startup! Spot, a new highlighting feature inspired by the Google Toolbar and the Firefox Searchbar. Simply type a string prefixed with ">" and followed by "|" into the Address Bar and press Enter. The string will be highlighted in the file list wherever it's found. Syntax and functionality have been enhanced in version 8.30! Simply type ">" plus one or more characters into the Address Bar and press Enter, and the focus will jump to the next file beginning with those characters. It's like Type-Ahead Find but done through the Address Bar or whatever location port (Catalog, Favorites, Go To, Scripts, etc.). To remove the highlights, simply enter >, or repeat the same pattern. Spot patterns can be stored in the Address Bar, as Favorites, or in the Catalog, and thus made be available to a single click. Media preview got Play/Pause/Stop buttons. Media preview now supports A-B Repeat. The command run now has a wait parameter which allows you to shell processes synchronously (the script waits until the process has terminated). 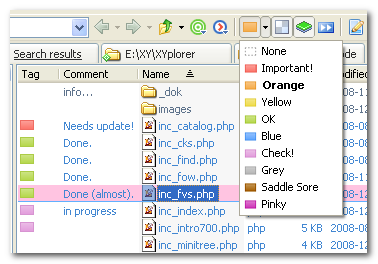 The latest XYplorer lets you assign tags and comments to any files or folders. Tags. 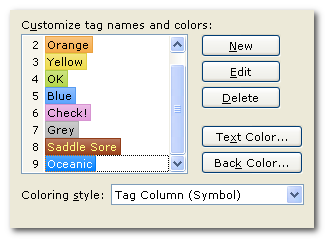 Tags let you give colors and labels to individual filenames. The tagging is done very comfortably via keyboard shortcut, toolbar button, or context menu. Of course, tags are retained across sessions. Comments. You may as well attach individual comments of virtually any size to your files and folders. Just like the color tags, the comments are retained across sessions, and if you move a file the comment moves with it. If files are your daily business, you will surely know what to do with comments. From version 8.70 onwards you can search for files by their tags or comments! Visual Filters. 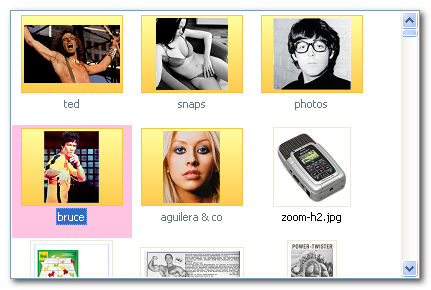 Now you can define any filter to apply only to files yet show or hide all folders. \|a* = Show all folders and only files beginning with "a"
!\|a* = Hide all folders and show only files beginning with "a"
Scripting. Now the so-called Heredoc syntax is supported. It allows you to deal with line feeds, quotes, and other protected characters in a straight-forward manner. My name is Bond, "James Bond". You can "quote" me on that. X close buttons on tabs. 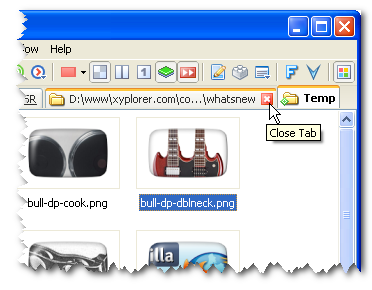 Now the tabs optionally show X close buttons, giving you a one-click way to quickly close foreground or background tabs. In a nifty variation of the common X button implementation you can opt for displaying the X buttons only when hovering a tab. 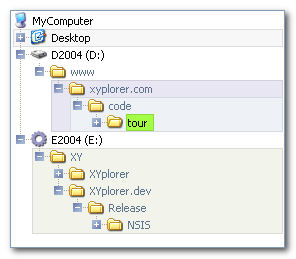 A new revolutionary and fascinating XYplorer only feature. Scripting. Now the important control structures while loop and if/elseif/else block are supported. Any EXIF data are preserved.